Meanwhile back at the ranch… Most of us unwashed folks will have Nescafe. Quick, easy and ok. Meanwhile back at the ranch…Most of us unwashed folks will have Nescafe.Quick,easy and ok. I think the preferred term in Melbourne is coffee nazi or, at the very least, coffee snob : ) Melbourne, washed and unwashed united, may in fact be the only city in the world to have virtually run Starbucks out of town. Go team! 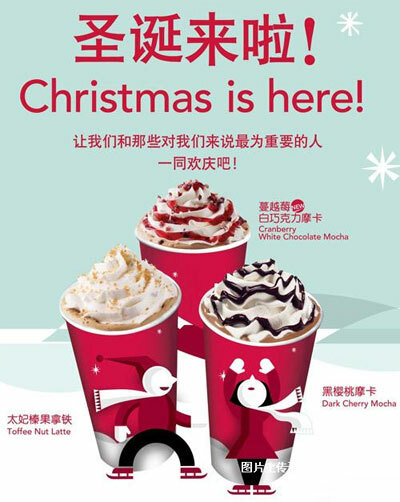 Right – to the vast majority of Chinese people, Nescafe is “coffee”. I suggested that my office get a coffee machine a few months ago and they got a refrigerator-sized Nescafe dispenser that ejects a small paper cup and fills it with one of three flavors of instant coffee. I just laughed. When I showed them what an actual coffee machine looks like and explained the brewing process the response was “Oh, I don’t think we can handle that”. My pleasure Melina! in italy, in the working time usually we drink espresso… but every family at home have “moka” or “moca” because you can prepare for more people (family). WTF? “Cranberry White Chocolate Mocha”? That sounds horrible. Maybe GoChengdoo can get Dandoval to drink that thing. They have it in the states also, it’s not exclusive to China. According to the official site it’s a 500 calorie drink with 59 grams of sugar. That’s like putting 15 cubes of sugar in your coffee.